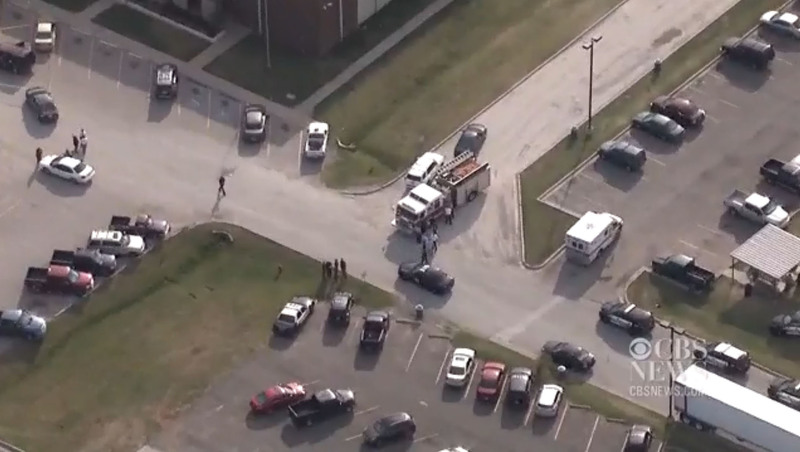 MOORE, Okla. - An "angry employee" at a food distribution center in suburban Oklahoma City stabbed two women, killing one of them, Thursday before an off-duty law enforcement officer shot the suspect, police said. Moore Police Sgt. Jeremy Lewis told reporters at the scene that the suspect attacked the first two people he encountered at Vaughan Foods in Moore before the off-duty officer who was working at the business shot him. The surviving victim and the suspect, a man, were both hospitalized. The motive for the attack was unclear, but Lewis said the suspect and the victims were apparently not involved with each other outside of their work at the business. "The victims had no relationship to the suspect. He is just an angry employee that acted out," Lewis said. Police were called about 4:15 p.m. to reports of a fight inside Vaughan Foods and while en route, officers were told that there had been a shooting, Lewis said. "When officers arrived they approached the business as an active shooter situation. Once they entered the business they found a female deceased of stab wounds and they had a male with multiple gunshot wounds," Lewis said. Lewis did not immediately return phone calls to The Associated Press seeking further comment. A phone call to Vaughan Foods late Thursday afternoon was not answered and a spokeswoman for its parent company, Reser's Fine Foods, did not immediately return calls.